Step One 1) We admitted we were powerless over alcohol- that our lives had become unmanageable. 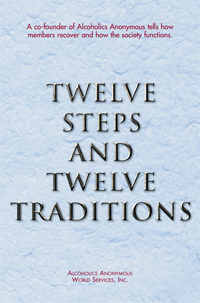 Tradition One 1) Our common welfare should come first; personal recovery depends upon AA unity. Step Two 2) Came to believe that a Power greater than ourselves could restore us to sanity. Tradition Two 2) For our group purpose there is but one ultimate authority - a loving God as He may express Himself in our group conscience. Our leaders are but trusted servants; they do not govern. Step Three 3) Made a decision to turn our will and our lives over to the care of God as we understood Him. Tradition Three 3) The only requirement for AA membership is a desire to stop drinking. Step Four 4) Made a searching and fearless moral inventory of ourselves. Tradition Four 4) Each group should be autonomous except in matters affecting other groups or AA as a whole. Step Five 5) Admitted to God, to ourselves, and to another human being the exact nature of our wrongs. Tradition Five 5) Each group has but one primary purpose - to carry its message to the alcoholic who still suffers. Step Six 6) Were entirely ready to have God remove all these defects of character. Tradition Six 6) An AA group ought never endorse, finance or lend the AA name to any related facility or outside enterprise, lest problems of money, property and prestige divert us from our primary purpose. Step Seven 7) Humbly asked Him to remove our shortcomings. Tradition Seven 7) Every AA group ought to be fully self-supporting, declining outside contributions. Step Eight 8) Made a list of all persons we had harmed, and became willing to make amends to them all. Tradition Eight 8) Alcoholics Anonymous should remain forever nonprofessional, but our service centers may employ special workers. Step Nine 9) Made direct amends to such people wherever possible, except when to do so would injure them or others. Tradition Nine 9) AA, as such, ought never be organized; but we may create service boards or committees directly responsible to those they serve. Step Ten 10) Continued to take personal inventory and when we were wrong promptly admitted it. Tradition Ten 10) Alcoholics Anonymous has no opinion on outside issues; hence the AA name ought never be drawn into public controversy. Step Eleven 11) Sought through prayer and meditation to improve our conscious contact with God as we understood Him, praying only for knowledge of His will for us and the power to carry that out. Tradition Eleven 11) Our public relations policy is based on attraction rather than promotion; we need always maintain personal anonymity at the level of press, radio and films. Step Twelve 12) Having had a spiritual awakening as the result of these steps, we tried to carry this message to alcoholics, and to practice these principles in all our affairs. Tradition Twelve 12) Anonymity is the spiritual foundation of all our Traditions, ever reminding us to place principles before personalities.